To do Bicycles, start lying on your back with your knees bent and feet flat on the ground and your hands behind your head. Press your low back into the ground and then lift your feet up off the ground, bending your hips to about 90 degrees. Then crunch up, keeping your elbows wide as you lift your shoulder blade up off the ground. Keep a space between your chin and your chest. Then bring your right knee in toward your chest as you extend your left leg out straight. Keep the left leg up off the ground. The higher up toward the ceiling you kick it out, the easier the move will be. The closer to the ground you kick the leg out, the harder it will be. As you bring the right knee in, crunch your upper body up and rotate to bring the left elbow up and across to touch your right knee. You don’t actually need to touch them together, but you do want to rotate that elbow toward the opposite knee. As you rotate, you can drop the other elbow down toward the ground. Try to keep your elbows wide and a space between your chin and your chest. Then straighten your right leg out and bring your left knee in as you rotate your left elbow to the ground and your right elbow toward your left knee. 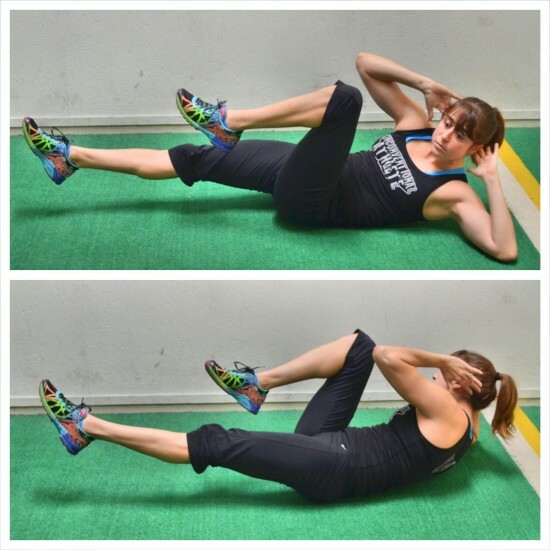 Keep your abs engaged and your low back pressed into the ground as you rotate and straighten your legs out. If you start to feel your low back take over, kick your legs out higher or even modify by keeping both knees bent and touching one toe down to the ground instead of kicking the leg out. Keep rotating and alternating touches until all reps are complete.